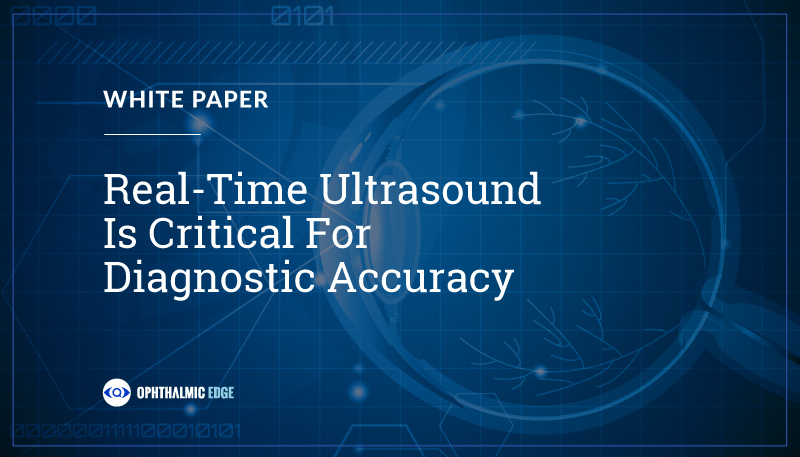 Home · Education · Why Is “Real Time” So Important To Diagnostic B-Scan Ultrasonography? It Isn’t – It’s CRITICAL! In Ophthalmic Contact B-Scan, Real Time imaging, alongside Grey Scale and 3-Dimensional Thinking, is one of the most critical concepts for interpreting images and is crucial for diagnostic accuracy. This article will focus on Real Time coupled with movement of the globe during careful complete imaging of all portions of the eye. In clinical practice, most diagnostic B-scans are vitreoretinal evaluations performed with a 10-20 MHz transducer. These B-scan images are created by following careful plans for a complete examination of the globe from the posterior lens surface to the optic nerve region and rely on a number of techniques well established in the literature. My personal approach can be found on my free website Ophthalmicedge.org. Real time images created and stored on the ultrasound instrument are 10 second segments that demonstrate and store movement during voluntary ocular motions created by the patient as requested by the examining physician or professional technician. Normal and abnormal movements are easily detectable during such ocular movement…many are diagnostic in appearance. For example, movement of the vitreous at first lags the movement of the globe. Central syneresis is easily visualized when the highest gain settings are employed. The face of the formed vitreous gel – (not seen when completely attached) becomes visible as soon as it separates from the internal limiting membrane of the retina (axial resolution is approximately 150 microns so the very earliest separations are not detectable with current ultrasound devices). The vitreous face is visualized as a mild to moderately reflective and discernible grey line moving in a rapid, staccato dance-like pattern within the vitreous cavity. Often the condensed collagen ring surrounding the optic nerve head now separated as part of the formed vitreous (Weiss ring) can be detected. It is more reflective than other portions of the formed vitreous gel and therefore shows as an intense round or often open circle “floater” moving with the vitreous face just in front of the optic nerve head region. For the examiner, detection of vitreous status and the consistency of the formed vitreous are usually dependent upon interpretation of movement. I often use radial scans to image the detached vitreous base in an attempt to delineate traction and retinal tears. Without movement in Real Time, vitreous status is almost impossible to ascertain. As a vitreoretinal surgeon, I use Real Time in all exams since observation of change over time and/or surgical planning is dependent upon a solid understanding of the position and status of the formed vitreous body especially when there are questions concerning vitreo-retinal traction or tears. Retinoschisis, usually found infero-temporally is seen as a thin, highly reflective, dome-like blister adjacent to the ocular wall with little or no movement in real time. Scleral depression during ultrasound evaluation reveals little or no collapse. The lesions are often bilateral although not often symmetrical. Rhegmatogenous Retinal Detachments, if large enough, have characteristic movement during command motions of the globe. The retinal tissue which is highly reflective and bright during B-scan tends to undulate in a slower fashion than the staccato vitreous motion. Complete retinal detachments are also revealed by persistent attachment to the optic nerve head. Traction Retinal Detachments such as those seen in diabetic disease do not move and are usually less extensive with an anatomical appearance of tent-like elevations often involving the vascular arcades. Choroidal Detachments, located usually anteriorly within the globe are visualized as elevated dome-like internally clear lesions that appear thicker than retina alone since the image includes the retina and choroid. Usually, little motion is detectable with movement of the globe. Hemorrhagic choroidals have more intense internal reflections and little or no movement. Internal movement may be seen as the hemorrhagic clot becomes liquefied. These few examples demonstrate the importance of Real Time movement as a diagnostic tool for interpretation of B-Scan ultrasound. The same techniques are useful in anterior segment high resolution B-scan as well but that will be a subject for a future white paper. For those new to ultrasound, understanding this unique imaging concept of Real Time is a stepping stone to successful interpretation of diagnostic images. More about “Real Time” to come this August.